A flexible suite of resources providing full coverage of the Cambridge IGCSE® English as a Second Language syllabuses (0510/0511/0991) for first examination in 2019. 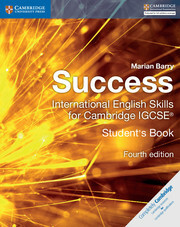 We have updated Success International English Skills in line with the latest Cambridge IGCSE® English as a Second Language (0510 / 0511 / 0991) syllabuses. The student’s book is for learners who are confident using English and are ready to learn more advanced vocabulary and expressions. We have updated this resource with interesting texts and there are now more listening activities than in previous editions. We have also added exam-style questions that include comprehensive coverage of the new task types. Answers to the student’s book questions are available in the teacher’s book. Exam-style questions in every unit allow students to practise what they have learnt on the course and prepare themselves for the examination. The course has a strong focus on developing students' grammar and vocabulary. Useful 'Grammar Spotlight' features emphasise the necessary language and grammar needed at this level and ensure students understand how and why they should be using it. Engaging new texts and a wider range of text types reflect the revised syllabus and offer students a deeper insight into the language and culture. 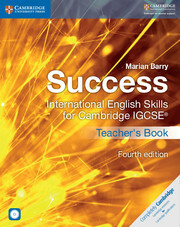 Written by Marian Barry, an author with 25 years' experience of teaching and examining. Improved structure provides a clear route of progression through the book and makes the resource easier to use. ‘Advice for Success’ sections in each unit motivate students to think about how they learn, giving them a platform for self-improvement. This edition features more listening exercises than previous editions, so students get extra practice with one of the more challenging aspects of the course. 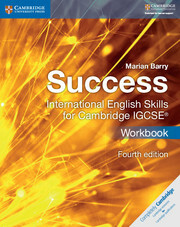 A selection of audio transcripts are available in the student's book. 10. The world of work.